There is a secret trick that the pros use to sell a new environmental insurance policy. 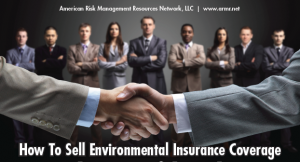 In this Users Guide I reveal the secrets of the trade utilized by the most successful sellers of environmental insurance policies. Many of the insights presented here are the result of 30 years of full time observations in the field. The normal insurance sales process of filling out insurance applications, getting multiple quotes, proposing, and hopefully getting an order needs to be inverted in order to achieve any kind of success in the sale of environmental insurance. The person in charge of sales for the insurance brokerage firm was trying to figure out why a handful of producers did well in selling environmental insurance but most did not. Even top sales people almost always failed at completing the sale of pollution insurance. What I came up with for the explanation was the successful sales folks were doing things a lot differently in the production process than the unsuccessful sales folks. Success had little to do with insurance market access or products. The first step in selling a pollution insurance policy to a new buyer (the best prospect) is to firmly establish the need for the environmental insurance coverage by teaching the customer about the effects of pollution/fungus/mold/bacteria exclusions on their risk management strategy. Without that first step there is little hope of actually getting an order on a pollution insurance policy at any price. Coming to the table with a bunch of insurance quotes will not increase the chances of success, but it will burn out everybody involved in the process of getting those quotes.